3.8 out of 5 based on 29 bloggers and 5 commenters. 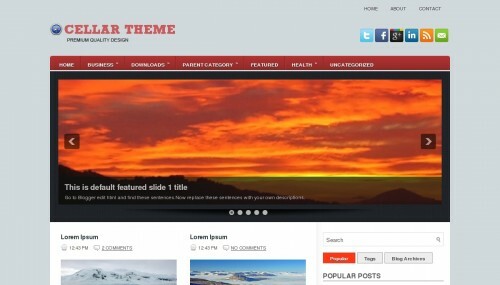 Cellar is a free blogger template adapted from WordPress with 3 columns, right sidebar, footer columns, slider, social bookmarking icons, posts thumbnails, tabs and drop down menu. Excellent template for blogs about internet or science. Muito lindo, para bens ao criador, realmente, excelente. Um dos mais bonitos já postados nesse site. Mas gostaria de saber como é que eu faço pra tirar a opção Leia Mais ( Red More), desse modelo, pois com as mudanças do Blogger em q agora estão aparecendo propagandas indesejadas, as postagens ficam todas desorganizadas por causa das propagandas q tomam o lugar das postagens. Então eu queria deixar no modo normal, um postagem abaixo da outra sem o Leia Mais. A unica coisa q quero trocar no modelo é isso. Já tentei vários sites em busca d como fazer isso, mas ñ acho nada. Agradeço s poder me responder o mas rápido possível. The comment reply link not working with this theme. I tried to find a fix and I have not been successful. People are able to leave comments, but the reply does not work. Any help you can offer would be greatly appreciated! I like this theme a lot and do not want to have to change to another. Cellar Theme template is ok, it works well. But Cellar Theme without slider option, has a problem with tabs widgets, they don’t run correctly. Could you please tell us how to fix it up? Thanks.